Our favorite sailor suit wearing duck is celebrating his 80th birthday this month! Donald Duck made his big screen debut on June 9, 1934 in Walt Disney’s Silly Symphonies cartoon titled, “The Wise Little Hen.” Since then, he has undergone several makeovers and his lengthy career has delighted generations of fans. 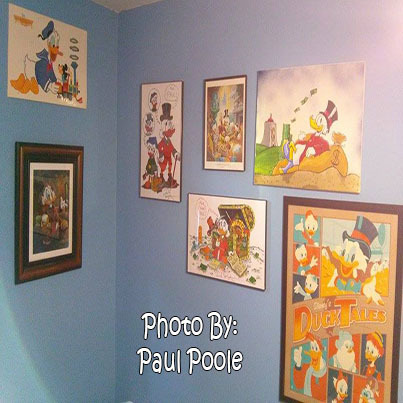 In honor of this milestone event, I interviewed my good friend, Paul Poole who is both a movie buff and a Donald Duck enthusiast. He owns an extensive Donald Duck memorabilia collection and has an appreciation for his career in both comic books and film. So without further ado….I give you my exclusive one-on-one interview with Donald’s number one fan. Winnie: Donald Duck has appeared in over 150 theatrical films and cartoons. What in your opinion has been the pinnacle of his career? Paul: With that much screen time under his belt …wait, Donald doesn’t wear pants! With that much screen time you want me to cite his best? I’m partial to “The Band Concert” from 1935. It’s most famous for being the first color Mickey Mouse cartoon, but I love it because throughout the short, Donald keeps one-upping Mickey. Donald’s a bit of a born loser, but in this early appearance he wins big. That being said, 1942’s “Donald’s Snow Fight” has it all. It’s all about Donald getting into the most over the top snowball fight, make that snowball war with his nephews Huey, Dewey and Louie. The gags come fast, the nephews were front and center and Donald’s popularity was sky high during the war years. Winnie: What is it that you love so much about him? Paul: We can all relate to Donald. He’s got a temper. He’s a bit arrogant. He rarely comes out on top, and usually it’s his own fault. However at times he can be the hero, and I think that’s a reflection on all of us. He was Disney’s workhorse. Most people forget how few Mickey cartoons there were. Once color cartoons began, Mickey was already losing steam. He’s too pure. Too innocent. Most people also don’t know how often Disney was in financial trouble. Snow White was a huge hit. His next several films were not. We may consider them classics now, but at the time this wasn’t true. Throughout the lean times, Donald was Disney’s go-to star. Much funnier than the other characters and easier to write. Mickey sells T-Shirts. Donald sells cartoons. It’s easy to forget this now with Mickey Mouse Clubhouse. They sort of push Donald aside a bit. Winnie: Over the years we have been introduced to Donald’s nephews, girlfriend and even a grumpy miserly Uncle. Which character stands out as your favorite? Paul: Easily Scrooge McDuck. By far the most fleshed out character in the entire Disney pantheon of characters, old “Unca” Scrooge made his debut in 1947. Created as a one-time character by classic Donald story-man, Carl Barks, it quickly became clear that the World’s Richest Duck could work as a springboard to send Donald and the nephews on adventures. Much to everyone’s surprise, Scrooge became so tremendously popular that he spun off into his own comic book series that by 1960 was the best-selling comic book in the world. Outselling Superman, Batman and well….everyone else. Over a million copies of each issue were devoured by readers. Carl Barks wrote and drew Scrooge stories from 1947 until his retirement in 1967. Barks left behind a legacy of over 500 Duck stories widely hailed by critics as the best comic stories ever written. Years later, his adventure comedies would inspire the hit DuckTales animated series. The story of Scrooge is long, inspiring and complex, but to be brief, it’s an amazing immigrant story about a poor young Scot inspired to work hard and endure countless hardships and heartbreak on his way to become the richest man in the world. He gains it all and does so by earning it all honestly but in the process loses a bit of his soul….until his nephew and grandnephews come into his life to reignite his adventurous spirit and regain his family. Winnie: Donald appears in comics and newspaper strips and has been drawn by several artists. Do you enjoy one artist’s rendering of Donald over the others? Paul: Carl Barks is known as “The Duck Man” for good reason. From his early days as a story and gag man on the classic Duck shorts of the 30’s and 40’s to his retirement in 1967, Barks is the gold standard. Barks helped in the creation of the nephews and was responsible for slowly transforming them from bratty little hellions into the wunderkind Junior Woodchucks. Other creations owed to Barks are Duckburg itself, the aforementioned Scrooge McDuck, Donald’s supernaturally lucky cousin and foil, Gladstone Gander, brilliant yet impractical inventor, Gyro Gearloose, sorceress Magica De Spell, relentless criminal family the Beagle Boys, and Scrooge’s dark mirror image and World’s Second Richest Duck, Flintheart Glomgold. The only other creator in my opinion to truly carry on Barks’ brilliance would be Don Rosa. Beginning in 1987 and recently retired, Don Rosa took his love of Barks’ tales and finally told the full origin of Scrooge, his Number One Dim, the Beagle Boys, and even introduced Donald’s mother and Scrooge’s sister, Hortense. The story of Scrooge’s life, “The Life and Times of Scrooge McDuck”, won the prestigious Eisner award… no small feat for a “talking animal book”. Winnie: As you know, Donald has graced many products with his likeness. Which do you think are the strangest? Paul: One of my favorite items in my personal collection are the 1950’s Sunshine paper drinking straws. The most bizarre items I have were both found by my wife at dollar stores. One is a hand warmer the other a washrag. Have to keep those tail feathers clean! 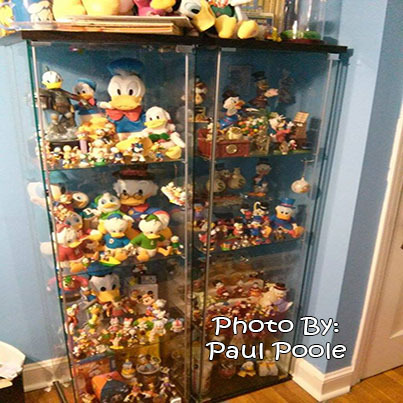 Winnie: When were you introduced to Donald and what about him sparked the idea to start your collection? Paul: I really have no idea when I was introduced to him! I was born in 1976 and I know I received a 1977 Hasbro Romper Room Dancing Donald Duck doll for Christmas in ’77. So I guess somewhere around there! When it comes to collecting Ducks, I actually started out collecting Uncle Scrooge items and it exploded into all the Ducks soon after. Winnie: How many pieces of Donald memorabilia do you own? Paul: Between movies, figures, statues, pencil sharpeners, comics and art, I lost count after 400. Winnie: What is your prized Donald keepsake and why? 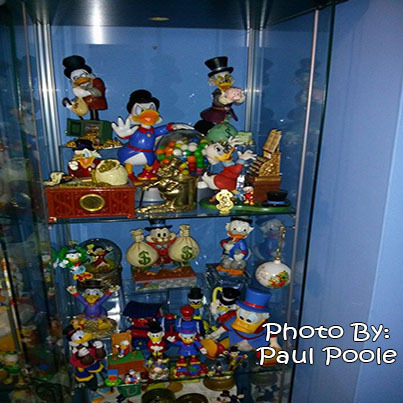 Paul: My most prized Donald item would be the previously mentioned Dancing Donald Duck doll. I had honestly forgotten about it until I stumbled onto one on EBay and the memories came flooding back. 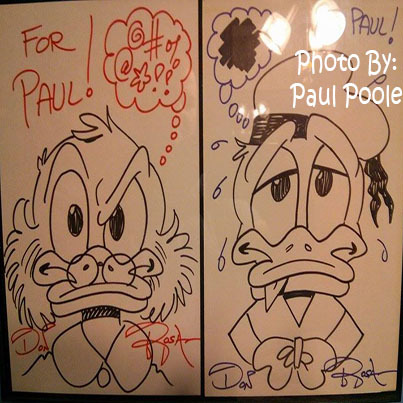 My most prized Duck item in general though would be the 8×10 photo of Uncle Scrooge signed and personalized by Alan Young, the actor who provides Scrooge’s voice. He’s in his 90’s and still providing the voice. That’s pretty amazing! Winnie: Where do you find the pieces for your collection? Paul: I find things on EBay mostly. Craigslist a few times. Friends seem to find things when Christmas or my birthday come around. My wife, Dawn, finds lots of it by searching the local flea markets with my son while I work most Sundays. She’s great like that. I’ll come home and she’ll have a plastic bag filled with stuff and I’ll ask how much. Somehow she never seems to spend more than 5 bucks! Winnie: Are there any figures that you wish you could add to your collection? Paul: YES! Donald and family are extremely popular in Europe still. Short attention spans seem to be an American thing. In Europe the ducks have always been the most popular Disney characters, and that popularity has never waned. In Italy they released a large series of Disney figurines designed by Disney comic artists and strictly stuck to Donald, Mickey and Goofy and their friends and enemies. They aren’t too pricey, but the cost to ship them over here is often more than the figurines themselves. I stick to the Ducks of course, and for some reason I have never been able to come across a Magica De Spell. Oh! And in Italy she’s known as “Amelia”. Go figure. I guess that one was popular. Perhaps because she’s Italian despite the Russian voice June Foray gave her in the DuckTales cartoons. As a side note, Flintheart Glomgold isn’t Scottish like Scrooge. Nor was he supposed to live in Duckburg. He’s from South Africa. 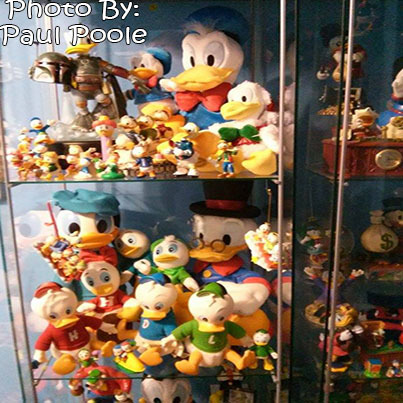 I want to thank Paul for taking the time to share about his collection and some really cool facts about Donald Duck. Here are some additional photos that Paul shared of his memorabilia and art work that he has collected over the years. 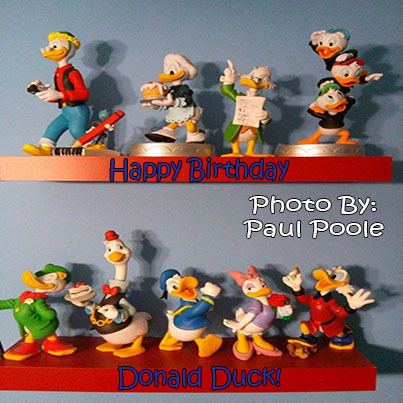 This entry was posted in Disney Characters and tagged Donald Duck, Donald Duck Collection, Happy Birthday Donald Duck. Bookmark the permalink.